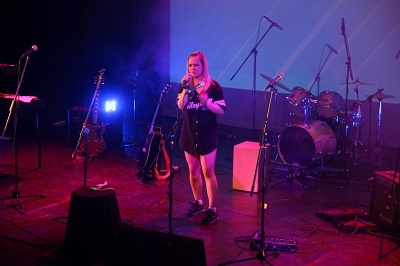 A class of BTEC music students from West Thames College hosted a charity talent show on 21 May to raise money for Shooting Star Children’s Hospice. ‘The Sound of Survival’ saw 10 acts take to the stage to battle it out to be named the winner. Singing duo Breah Cooper, 17 and Desire Marianne, 23 scooped first place after impressing the judges with their performance. David Lyons from the Shooting Star Children’s Hospice opened The Sound of Survival and praised the students fundraising efforts and the support they have shown the charity. The students are collecting final donations before sending the cash to the Shooting Star Children’s Hospice next week.